Russian cosmonaut Pavel Vinogradov waves shortly after landing on board the Soyuz TMA-08M space capsule some 146 km southeast of the town of Zhezkazgan in Kazakhstan on September 11, 2013. The three crew of the International Space Station (ISS) who returned to Earth this week endured a hair-raising descent after their height sensors failed, a Russian cosmonaut revealed on Friday. The three crew of the International Space Station (ISS) who returned to Earth this week endured a hair-raising descent after their height sensors failed, a Russian cosmonaut revealed on Friday. Pavel Vinogradov said that he and the two other crew of the Soyuz capsule which touched down in Kazakhstan Wednesday had groped their way through the landing after they lost all data about their height from the ground. "There were problems. For some reason after the undocking all our parameters disappeared. Essentially, after the undocking, we flew blind," he said at the Star City cosmonaut training centre outside Moscow, quoted by Russian news agencies. He said that the only data the crew could receive about their approach to the earth—crucial for knowing when to fire the engines to soften the landing—came from the salvage team on the ground. 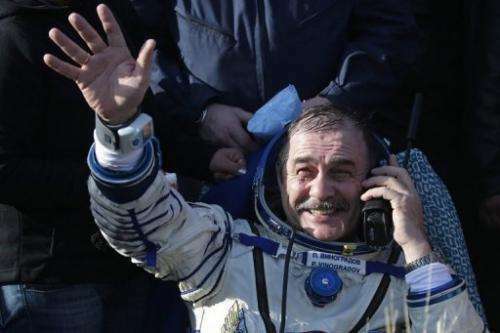 He said the rescue teams were able to radio to the crew that they were 300 metres (1,000 feet) and then 100 metres (330 feet) from the ground in the Soyuz capsule, which lands vertically with the help of a parachute after reentering the atmosphere. "I managed to count eight seconds and we touched down very softly," he said, adding that aside from the usual G-forces and jolting "everyone felt normal". Russian cosmonauts Pavel Vinogradov is seen in the Soyuz TMA-08M space capsule shortly after its landing some 146 km southeast of the town of Zhezkazgan in Kazakhstan, on September 11, 2013. The three crew of the International Space Station (ISS) who returned to Earth this week endured a hair-raising descent after their height sensors failed, a Russian cosmonaut revealed on Friday. Vinogradov, fellow Russian cosmonaut Alexander Misurkin and NASA astronaut Chris Cassidy touched down on the Kazakh steppe on Wednesday morning, in a landing that at the time seemed hitch-free. Russia is currently the only nation capable of transporting humans to the ISS in its Soyuz rocket and capsule system after the withdrawal of the US shuttle.